Building a network is probably the most important thing you can do to be successful. Virtually everything you accomplish is with the help of others you trust and who trust you; from finding a job to obtaining new clients or employees. So why don’t you spend enough time developing your network? Networking is not hard to do. But it’s very easy to NOT do. We all get hung up on our day-to-day activities and we put off networking. Partly it’s because we’re busy. But it’s also because it makes many of us uncomfortable. We think of networking as sales. It’s not. Sales is trying to get people to do something for you. Networking is trying to do things for other people. Whenever you meet someone, whoever it is, do your best to get to know the person and see what problems that person is facing. Then, do whatever you can to help him or her solve the problem: recommend a book, or direct the person to a website, or make an introduction to someone who might be helpful. Make a deposit in that person’s emotional bank account. Don’t try to make a sale. Try to make a friend. The more you pour into each relationship, the more likely it will be that you will ultimately reap rewards. If you are known as a person that will always be there for others, many of them will be more than happy to be there for you when you need it. Interestingly, since the most valuable resource you can provide is the help of others in your network, the larger your network becomes, the more valuable you are to everyone in your network. Many positive things occur when two people who know you, and like you, have a conversation about you. For example, one might remind the other that you are the perfect person to handle a new business assignment. Just by having that conversation you may be top-of-mind to each of them when another person needs something. Now let’s look at the mathematics. As the number of people you know rises arithmetically, the number of connections between those people rises geometrically. 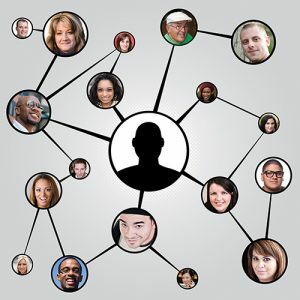 If, for example, you know 100 people, there are 4,950 potential connections between those people – 4,950 possible conversations. If, on the other hand, you know 500 people, the number of potential connections rises to more than 125,000. In fact, with each new person you befriend, you add possible new connections equal to the number of people you already know.